Vibrant sparkling Arkansas quartz crystal cluster of large cabinet size [2-1/4 highx 2-3/4x 4-3/4"] just jamming with energy. 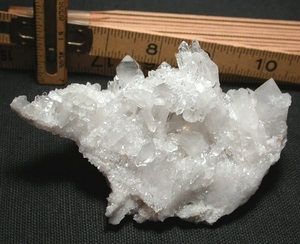 Layers and layers of doubly-terminated points, drusy, and crystals in parallel growth spread out in all directions covering a milky quartz matrix. Crowning the collection is a raised 1-3/4" ring of basically four mini-cathedrals, with rainbows. A tabular edge-grazed twin, 3/8x 1-3/8" is the largest point, with an Isis faced center point [Merlin] - extremely rare - next at 1-1/4" high. Record keepers, and showy from all sides.